Argan oil is a relatively new phenomenon in Western popular culture, but the Berber community of Morocco has turned to products from the Argan tree for centuries for everything from food to fuel. The oil, derived from the kernels of the so called “tree of life”, has been used by Berber women as a skin, hair and nail treatment to protect against the blistering heat and frigid temperatures in Morocco. But, it wasn’t until Western cosmetic companies discovered Argan oil’s extremely high concentrations of fatty acids and vitamin E that more and more consumers began to take advantage of its healing and anti-aging properties. 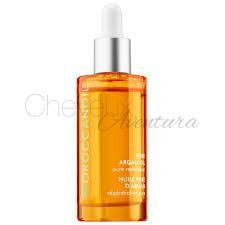 The principle benefit of Argan oil has been the radical improvement of skin care. With almost twice the amount of vitamin E as olive oil, Argan oil can ease the appearance of wrinkles and fine lines. By massaging a few drops in to problem areas at night, before applying your regular moisturizer, you can give your skin extra hydration that minimizes conditions like laugh lines and crows feet. You can also apply Argan oil, every other night, to problem acne to reduce the number of breakouts and tame overly oily skin. Eczema and Psoriasis sufferers have found all-day relief by using Argan oil as a spot treatment to relieve itching and dryness. Triterpenoids, the active ingredient in Argan oil, has ushered in a new era of skin care, and new uses are still being discovered. Argan oil has begun showing up in commercial shampoos because of its ability to moisturize dry hair from the roots to the tip, making use of its antioxidants to restore damaged cell membranes, and encourage growth. The difference between Argan oil and other hair moisturizers is that Argan oil delivers nutrition and luster to the follicles without being greasy. Applying a small amount of Argan oil to your comb before styling, helps control excessively curly or unmanageable hair by gradually softening the strands with strength building Omega 3 and Omega 9 fatty acids. For a conditioning treatment, massage Argan oil in to your hair and scalp before you take a shower, wrap your head in a hot towel and leave on for two to three minutes before washing your hair. Restaurants and home cooks have begun to include Argan oil in their diet to protect against the onset of hypertension. But, it’s also been shown, in studies conducted in both Morocco and Europe, that the “healthy fats” in Argan oil help prevent myocardial infarction and arteriosclerosis. Both of these conditions can be precursors to a heart attack, so the regular consumption of Argan oil contributes to both good health and a better quality of life. It’s important to note that cosmetic Argan oil and cooking Argan oil are processed differently. When used for cooking, the oil is toasted and has a rich, nutty flavor, similar to almond or hazelnut oil. Most people use it as a finishing touch to salads, vegetables, or towards the end of cooking chicken and fish.